In early December of last year, Lebanese Shiite leader Hassan Nasrallah of Hizbullah accused Saudi Arabia of being behind the bombing of the Iranian embassy in Beirut, i.e. charged Riyadh with terrorism. Then in the middle of December, a small terrorist group that calls itself “Helpers of Holy Jerusalem” blew up the headquarters of the State Security police in the provincial Egyptian city of Mansoura. The response of the interim appointed government of Hazem al-Biblawi was to declare the Muslim Brotherhood to be a terrorist organization. This decree was issued despite the lack of any evidence that the MB was behind the explosion (its key leaders are behind bars so how are they coordinating such things? ), and despite the obvious fact that the Brotherhood is a large longstanding group whose political party (the Freedom and Justice Party) won the parliamentary elections in late fall of 2011 and the presidency in June of 2012. I.e., the Brotherhood is not in fact a terrorist organization. In an interview published last week in al-Shuruq, Gen. Abdel Fattah El Sisi maintained that Khairat Shater, a Muslim Brotherhood insider who is now in jail, had threatened him with unleashing terrorism on Egypt (from Libya, Yemen, Iraq, etc.) if the military overthrew the elected Muslim Brotherhood government. Perhaps it is to this exchange that the government was referring in its decree. But Shater is not the leader of the movement and does not set policy; the Brotherhood had given up violence decades ago; and besides we only have El Sisi’s word for what was said. Late last week, Saudi Arabia followed suit, naming the Muslim Brotherhood as a terrorist organization. At the same time, Saudi Arabia (joined by Bahrain and the United Arab Emirates) more or less accused Qatar of supporting terrorism by virtue of its backing for the Muslim Brotherhood. Doha stood accused, in other words, of being a state sponsor of terror. So apparently Iraq and Saudi Arabia, whose governments don’t like each other, can agree on one thing, which is that Qatar is a state supporter of terrorism. (There is no actual evidence for such an assertion, though it is true that Qatar supports the Syrian rebels, some of which have declared affiliation to al-Qaeda; Qatar has condemned any such affiliation). Saudi Arabia angrily riposted to al-Maliki, categorically denying his allegations and regretting his “aggressive” and “irresponsible” language. Riyadh said al-Maliki was trying to shift responsibility for the sectarian Sunni-Shiite violence in Iraq from his own invidiously pro-Shiite policies. 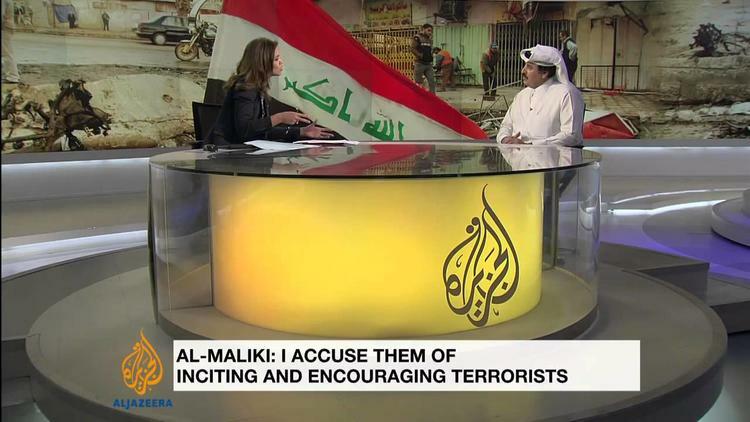 At least the Saudis didn’t accuse al-Maliki of being a terrorist. Yet. This outbreak of accusations of terrorism represents the final victory of Bush-Cheney rhetoric in the Middle East. “Terrorism” in this sense is not being used as a meaningful technical term, it just means “you are taboo, your ideology is unacceptable, you are beyond the pale.” The Israelis pioneered this way of speaking about political enemies, attempting to smear all Palestinian (and later Lebanese) resistance to Occupation as mere terrorists. Bush-Cheney applied it widely. Sarah Palin threw this kind of rhetoric around about Barack Obama himself. It is a profoundly undemocratic discourse, since democracy is about the reworking of disputes into political compromise or at least into civil voting on issues. Castigating a competing political current as “terrorist” is a refusal to engage in civil politics. US Chief Justice John Roberts abetted this stupidity by concurring that merely giving advice to a group designated by the US State Department as a terrorist organization constitutes material support for terrorism– even if the advice was itself non-violent. This is a way of making sure Americans cannot talk to groups such as Hamas or Hizbullah (though they can freely help or even join equally terroristic groups among Israeli squatters on the Palestinian West Bank). It is an unconstitutional abridgment of the freedom of speech and association guaranteed in the US Bill of Rights. “Terrorism” becomes a pretext for outlawing political discourse you don’t like. Of course, there are actual terrorist organizations. For a long time, the US Federal code had a useful definition of terrorism. It is a non-state actor that deploys violence against civilians for political purposes. After 9/11 the definition was amended to include “coercing a government.” The original definition was better. Deploying violence against e.g. occupation troops was allowed in international law. The violence of the National Liberation Front in Algeria against French forces was not terrorism, it was resistance. But bombing civilians (which the FLN also did) is terrorism, and is not permitted in any law. The Islamic State of Iraq and the Levant/ Syria (ISIL or ISIS) is a terrorist organization any way you want to define the latter. It routinely targets civilians for bombings and other violence in an attempt to coerce them. If it could be proved that any state intelligence apparatus was funneling money or arms straight to ISIL, that would be grounds for considering the government a state supporter of terrorism. But I doubt their support is governmental; there are lots of private multi-millionaires in the Gulf. I think it is more correct to accuse governments of committing war crimes than of committing terrorism. To be useful, the latter phenomenon should be used to categorize non-state actors. In the absence of violence, there is no terrorism. It is nonsense to make talking into a terrorism offense. Nor is it useful to castigate whole countries as ‘terrorism supporters’ and to shun them over political differences. The Bush administration did this to Iran, apparently on the grounds of its support for Hizbullah, which for the most part hasn’t functioned as a terrorist organization at all but as a national liberation organization; it has formally been recognized by the Lebanese government as a national guard for the south of the country. It is ironic that Hizbullah would now turn around and use this tactic against Riyadh. Middle Eastern, Muslim-majority states are now categorizing large, popular movements of political Islam as mere terrorist groups (it was the Neoconservatives who pushed the idea that the MB is a terrorist group, because of its harsh views on Israel; though note that when the Brotherhood was in control of Egypt, it did not abrogate Camp David). And some Muslim countries are accusing other Muslim countries of being state backers of terrorism. The nightmare that was proto-fascist America under Bush-Cheney has now battened onto the Middle East. This kind of discourse and tactic has derailed Egypt from any meaningful democratic transition, perhaps for a long time. Now an attempt is being made to close down the freewheeling debates of Aljazeera, which has a philosophy of letting all sides of an issue have a voice. (The Bushies did not like that any more than Riyadh and Cairo now do). There is a word for the current Saudi push against ‘terrorism’ in the Middle East. It is tyranny.